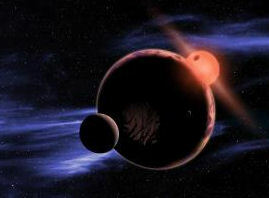 Astronomers have found the first multi-planet solar system orbiting a binary star (artist’s impression appears right). Importantly, the discovery shows that planetary systems can form and survive even in the chaotic environment around a binary star. The system, known as Kepler-47, is roughly 5000 light-years away. The discovery was detailed this week at the International Astronomical Union meeting and an accompanying study has been published in the journal Science. The new planetary system is located roughly 5000 light-years away, in the constellation Cygnus. The planets were discovered by the drop in brightness they cause when they transit (eclipse) their host stars. Precise photometric data from NASA’s Kepler space telescope allowed the transits and eclipses to be measured, which in turn provided the relative sizes of the objects. Jerome Orosz, Associate Professor of Astronomy at San Diego State University and lead author of the study said the primary star in Kepler-47 is about the same mass as the Sun. Its companion is an M-dwarf star about one-third the size of the Sun. 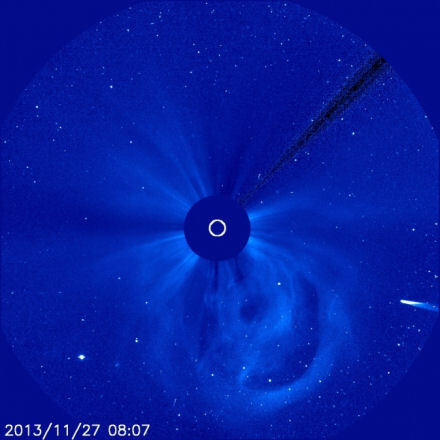 Orosz says the stars whirl around each other every 7.5 days. An analysis of the planetary transits indicates that the inner planet is three times the size of Earth and orbits the binary star every 49.5 days, while the outer planet is 4.6 times the size of Earth with an orbit of 303.2 days. 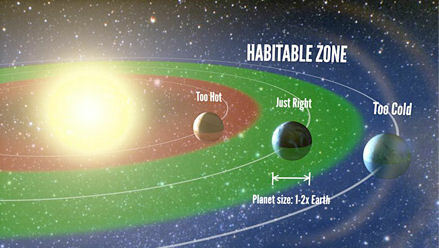 Interestingly, the outer planet’s orbit puts it in the “Goldilocks zone,” the region around a star where a terrestrial planet could have liquid water on its surface, and perhaps be habitable. 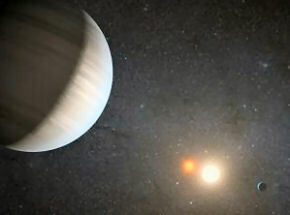 While the planet is probably a gas-giant planet and thus not suitable for life, its discovery establishes that circumbinary planets can, and do, exist in habitable zones.